Most purse hangers you see come with some kind of machine made ornament from China or some commercial looking cabochon. Not these! Mine are handmade by me, one of a kind lampwork glass cabs! You'll be the only one with a handbag hook like this! 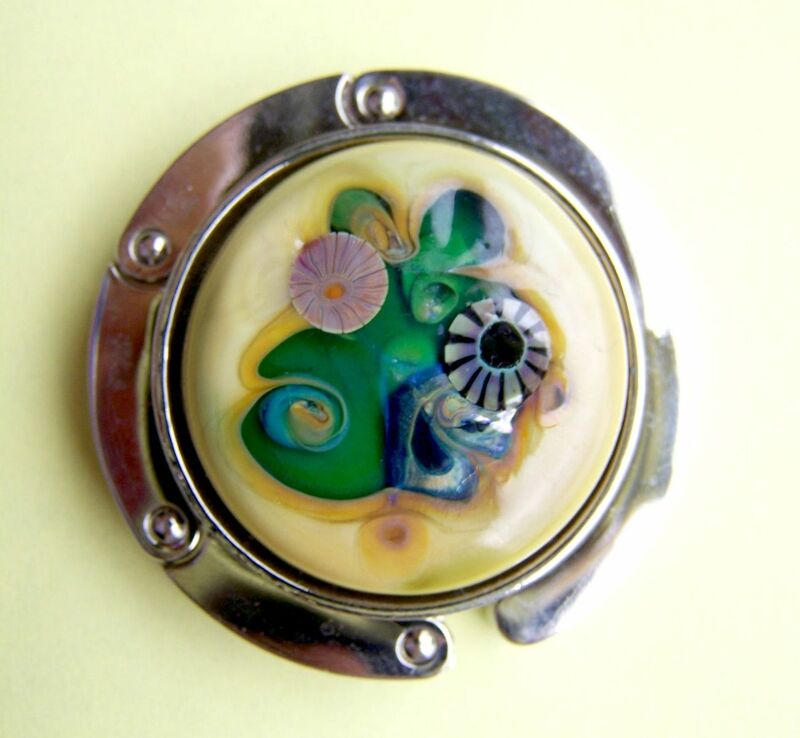 Purse hangers have really come into vogue lately and the hanger design that my handmade cabochon adorns is very clever. Designed to hold up to 20 lbs., they are used to hang your purse on, from a table or the arm of a chair, whenever eating out, at a bridge party or a night club . 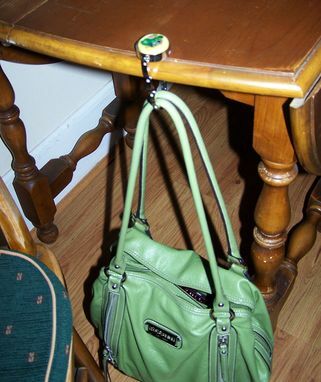 It's great because instead of hanging your purse on the back of a chair where someone could take it or bump into it, you have it in a closer more secure place. This one folds up neatly to stash in your purse and comes with an organza pouch. This design is made with a base layer of yellow opal glass which works well with silvered glass types. I randomly placed different Double Helix glass types on top, melted them, twisted and pulled them together to create an organic design. Then I placed a couple of beautiful murrini on melted them in and turned down the oxy to reduce them. The results is this lovely organic golden, green, pink, and silver design. I create each cab in the flame as lampwork beads are made, then they are popped in my digitally controlled kiln to anneal over night. They have been carefully cleaned out on the bottom by my sweet handy husband who carefully sets them in the purse hanger frame using an epoxy concoction to permanently adhere them. I personally guarantee all my work so if for any reason you are not satisfied you may contact me for an exchange, repair, or refund. My goal is customer satisfaction!